This isn’t the first time that Denzel Washington and Russell Crowe have squared off against each other in a movie. Anybody remember the 1995 sci-fi thriller “Virtuosity”? In that one, Denzel Washington was the cop and Russell Crowe was the bad guy, a virtual reality serial killer unleashed on the real world. In the years between “Virtuosity” and AMERICAN GANGSTER both actors have made an impressive amount of really fine films and they’ve both won Best Actor Oscars. Both men have achieved a level of respect and professional achievement that few actors today can claim. And separately just their names are enough to guarantee a big weekend box office. So putting them together again in a movie should assure us of some really outstanding scenes between the two of them since both men have done nothing but get better at their craft since 1995, right? I wish I could say it was so but AMERICAN GANGSTER is a lot like the Robert DeNiro/Al Pacino crime thriller “Heat” or Robert DeNiro/Kevin Costner in “The Untouchables” in that for most of the movie we’re following two separate but intertwined storylines and we have to wait about two hours before we get to what we want to see: the two main actors going at it. It’s worth the wait to finally see Denzel and Russell face to face, trust me on that but the few scenes they have together are so good you can’t help but wish they had more of them. It’s the 1970’s and Frank Lucas (Denzel Washington) has inherited the crime empire of his boss, the legendary Harlem gangster Bumpy Johnson who has passed away from an unexpected heart attack. Frank doesn’t waste time in consolidating his power. To do this he intends to control the heroin traffic in Harlem by cutting out any and all middlemen and making a deal directly with the supplier. Frank himself flies to Bangkok and with the help of his cousin (Roger Guenveur Smith) he strikes a deal for a previously unheard of amount of heroin that is 100% pure. He gives it a brand name: ‘Blue Magic’ and sells his product for half the price of his competitors. Frank brings up his family from North Carolina, including his elderly mother (Ruby Dee) and buys a huge mansion estate for them all to live in. He makes his five brothers his lieutenants and they proceed to make money. A whole lot of money. Ritchie Roberts (Russell Crowe) isn’t having as much fun in his life as Frank is in his. Ritchie’s wife is divorcing him because of his constant womanizing and his single-minded devotion to his job. Ritchie is such an honest cop that he turns in a million bucks to his superiors without even thinking for a minute about keeping it for himself. It’s simple for him because he looks at it simply: the money was made illegally. He’s a cop. Cops don’t take illegal money. Haw. Remember that this is back in the 1970’s when police corruption in New York was just part of the job. Ritchie is ostracized by his fellow officers and so he jumps at the chance when his boss (Ted Levine) gives him a chance to head up his own squad of Untouchables who will target the high-level drug dealers. No nickel-and-dime dealers. Ritchie’s investigations eventually lead him to Frank Lucas who has managed to stay under the radar for so long because he doesn’t go in for the flashy pimped out lifestyle of his peers like Nicky Barnes (Cuba Gooding, Jr.) Not Frank. He dresses in conservative business suits and takes his momma to church every Sunday. He doesn’t get high off his own supply and he runs his organization with a professionalism that makes him the gangland equivalent of Donald Trump. Frank intrigues Ritchie who is amazed that a black man could amass so much wealth and power that even old school Mafia kingpins like Dominic Gattano (Armand Assante) give him respect and he’s determined to take Frank down. It’s not going to be an easy job as Ritchie has no idea how Frank is smuggling his product into the United States and there’s a crooked cop (Josh Brolin) who is making life hell for both Frank and Ritchie. The lives of these two men intersect at a very critical juncture in their lives and once they join together their story has a unique twist. AMERICAN GANGSTER works extremely hard at wanting to be an epic crime drama. But I actually think it works more as a character study of the two men, Frank Lucas and Ritchie Roberts. Frank Lucas is a cold-blooded killer who can set a man on fire without blinking and sell heroin to children without losing a night’s sleep. But he also provides for his family, instills a (twisted) set of business values and ethics in his brothers and faithfully attends church every Sunday. Ritchie Roberts is a helluva cop who chases bad guys by day and goes to law school at night. He’s also a neglectful father and a lousy husband. Family values is an elusive concept for Ritchie who seems genuinely puzzled that his wife doesn’t accept his womanizing and off-hour association with the lowlife of New York City. I think that director Ridley Scott spends so much time on the separate stories of these two men, both of who are looking for The American Dream in their own way and allows us to examine their moral values and ethical codes and he wants us to make up our minds as to what we think of how they achieve it. Ridley Scott is a strange choice for this type of straight-up crime thriller. I think perhaps the closest he’s come to a movie like this is 1989’s “Black Rain” starring Michael Douglas. Ridley Scott is not the first director you think of when it comes to crime thrillers. In the hands of Martin Scorsese or Carl Franklin I think the movie would have had more bite to it. As it is Scott focuses more on how these two men conduct their business and their relationships to those around them. As a result you’re not going to find over-the-top violence such as in “Scarface” “Goodfellas” or “The Departed”. There is violence, sure. But it’s handled in an almost documentary like manner. Denzel Washington turns in his usual outstanding performance as Frank Lucas. By now we’re all so used to Denzel being so good that it’s no surprise that we’re not able to take our eyes off him when he’s on the screen. He’s gotten really good at playing bad guys. And Russell Crowe is easily his equal in acting ability. Separately they create fully realized characters and both men do more in a scene by saying nothing than other actors do with ten minutes of dialog. They’re just that good. And they’re backed up by an equally impressive supporting cast. Ruby Dee has a really splendid scene where she has to talk Frank down from doing something really stupid and the honesty of the scene comes right out of the screen and grabs you by the shoulders. Josh Brolin as Detective Trupo steps up his game considerably. He has scenes with Denzel Washington and Russell Crowe and damn if he doesn’t hold his own with the both of them. It’s an impressive acting job he does here. Chiwetel Ejiofor and Common have roles as two of Frank’s brothers. Cuba Gooding, Jr. continues his streak as the most puzzling actor of all time. Why does this man continue to waste his talent in unfunny so-called comedies when he has such a gift for dramatic roles? His five minutes as Nicky Barnes in AMERICAN GANGSTER beats out the entirety of “Boat Trip” “Rat Race” and “Snow Dogs” all put together. I was puzzled by Joe Morton’s character of Charlie Williams who in appearance is a near dead ringer for Gordon Parks. His character’s relationship to Frank Lucas is never really explained. He shows up every now and then, gives Frank some sage words of wisdom and then he’s gone. And while we’re on the subject the relationship between Frank Lucas and his wife Eva (Lymari Nadal) isn’t all that satisfying either. Despite the scene where Frank goes ballistic on Dominic Gattano when a hit on Frank goes wrong and his wife is almost killed I wasn’t convinced that either of them were ever that much in love with the other. 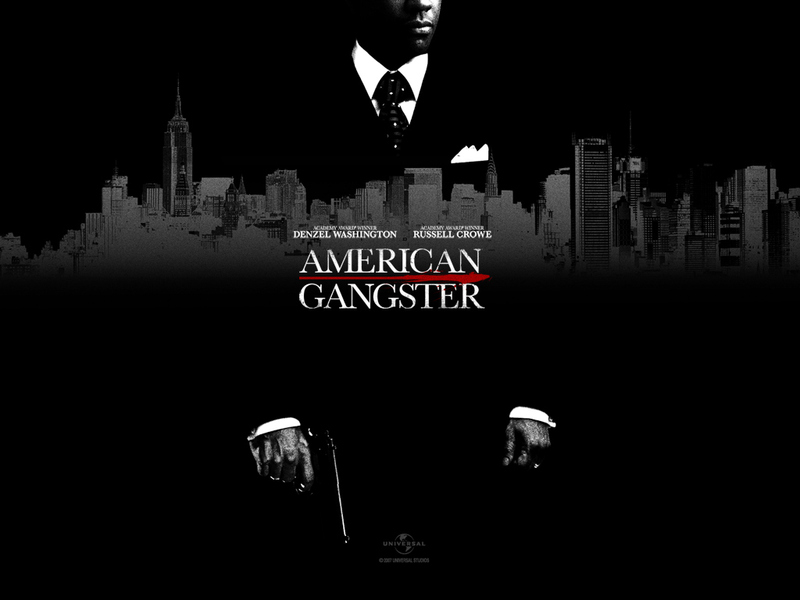 So should you see AMERICAN GANGSTER? If you’re a fan of Denzel Washington and Russell Crowe then you probably already have. And with good reason. Both men are at the top of their game right now and watching them work is truly a pleasure. The supporting cast does their job and backs up the leads superbly. The direction is realistic and not unnecessarily bombastic. And no, I don’t think that AMERICAN GANGSTER is the great crime epic it aspires to be but it is solid entertainment that’s worth your time to watch.